Investors - Ensyn - Renewable Fuels and Chemicals from Non-Food Biomass. Chevron Technology Ventures (CTV), a division of Chevron U.S.A., Inc., champions innovation, commercialization and integration of emerging technologies within Chevron. CTV is the company’s business and technology incubator, evaluating and demonstrating emerging technologies to improve Chevron’s efficiency and enhance the performance of its base businesses. Credit Suisse is a world-leading financial services company, advising clients in all aspects of finance, including Private Banking, Investment Banking and Asset Management. 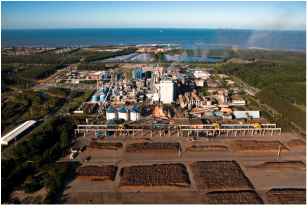 Fibria Celulose S.A. (NYSE: FBR), a Brazilian company, is the world’s leading producer of wood pulp, with production capacity of over five million tons of pulp per year. Ensyn and Fibria have established a strategic alliance that includes a 50/50 joint venture for production of renewable liquid fuels in Brazil. Mr. Vinicius Nonino, Fibria’s head of Strategy & Mergers and Acquisitions, is a member of Ensyn’s Board of Directors. learn more about fibria celulose s.a.
Impax Asset Management Group plc is a leading, London-based investment manager dedicated to the environmental sector. Impax has assets under management and advisory of over £2.3 billion for institutional and private investors, across a range of listed and private equity funds. InvestEco Capital, Canada’s first environmental investment company, manages private equity funds that are exclusively focused on high growth environmental sectors, including sustainable food & agriculture, renewable energy, clean technologies and water. Roseburg Renewable Energy is an affiliate of Roseburg Forest Products, a closely-held wood products manufacturer and timberland owner with operations throughout the United States. Roseburg has over 3,000 employees and over 80 years of operations. Ensyn has active projects utilizing its technology on 3 continents.